Three words: William Shatner album. Whoa...Didn't mean to scare you like that. But Captain Kirk's 1968 foray into recording, The Transformed Man -- with its overly dramatic and unintentionally absurd cover songs -- nicely illustrates what can and usually does go wrong when artists attempt to, er, expand their horizons. When most performers invade other genres, the results are excruciating at worst, yawn-inducing at best. At least Shatner's release is good for a hearty laugh. Rock stars might want to be movie stars and movie stars might want to be rock stars, but everyone is generally better off sticking to the day job. This all makes writer Madison Smartt Bell's musical debut, Forty Words for Fear, that much more of a unique triumph. A brooding collection of late night music for fans of Tom Waits, Leonard Cohen or James McMurtry, the CD impresses with its devilishly playful vibe and engaging musicianship. Released Tuesday, June 17, by Lincolnton-based label Gaff Music (gaffmusic.com), Forty Words developed in tandem with Bell's 2002 novel Anything Goes, a coming-of-age tale of a bass player in a Tennessee bar band. As he was penning the story, Bell -- author of 11 novels, including 1995 National Book Award finalist All Souls' Rising -- asked poet Wyn Cooper, a friend since their undergrad days at Hollins College, to write song lyrics for use throughout the story. The lyrics turned into true songs once Bell, a singer and guitarist in his spare time, set them to music. 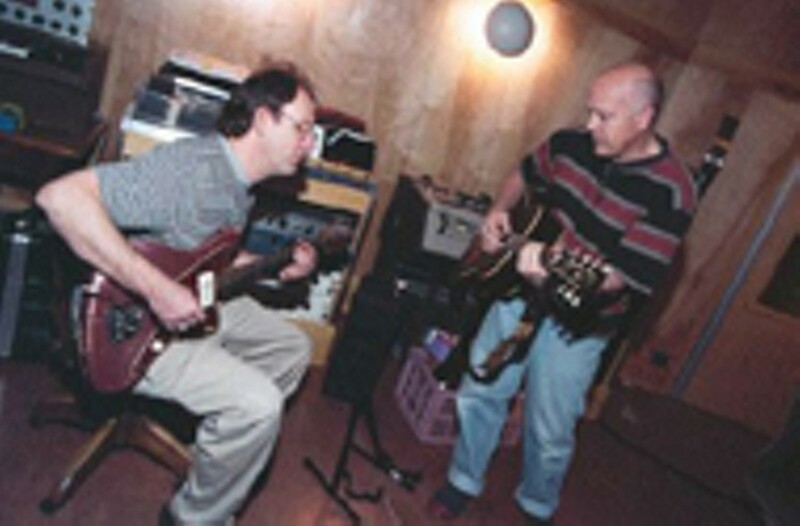 Gaff Music founder Scott Beal heard a demo, offered to release a full-length CD, then arranged for Bell and Cooper to record it with NC music scene heroes Don Dixon, Mitch Easter and Charlotte percussionist Jim Brock at Easter's Fidelitorium studio in Kernersville, NC. CL and Bell traded emails recently to talk about the album and his budding recording career. Creative Loafing: Did you have to work up courage to step outside your main gig and record an album? Madison Smartt Bell: I was nervous about choking on the session with Dixon et al, since I had done that on the previous session and it had been kind of hard to pull out. There were going to be journalists at the Fidelitorium from the start and I really wanted to delay them until we had a groove going. I talked to Dixon about it and he said, "Let "em come. I got nothing to prove!" And I thought, damn, I wish I could say that. But then it occurred to me that I could say I got nothing to lose. And that was helpful. "Fess up: When you asked Wyn for lyrics to use in the book, were you secretly harboring plans to set them to music? It wasn't that much of a secret. We had a simple letter of agreement about use of the lyrics and the possibility of me setting the words to music was a footnote to that. The only secret was I had previously tried a couple of times to do the poem "On Eight Mile" -- unsuccessfully. So my expectations were low. Did you set the lyrics to music after you wrote the book, or during? The book was about half done when I first showed it to Wyn. I began setting the lyrics almost as soon as I started getting them from him. For some reason it just suddenly started to work and I'd write the songs I liked as songs into the story line. Then the manuscript sat around for a couple of years, so as new songs got done I'd write them into the novel. How did the deal with Gaff Music come about? I knew Scott Beal [Gaff founder] as a book collector in the 80s. He used to send me books to sign. It was all by mail. We never spoke, but he sent me a fez and some other stuff. I knew he was a bit of a joker. Scott told me he was thinking of starting a record company and I sent him our tape. He told me he liked it but I didn't hear anything more for a couple of years. I made the final demo, to be used to promote the book, and promote the songs to other artists. When I got back from a trip, I had an email from Scott saying he was gearing up to start his label and was interested. How did you hook up with Dixon and Easter? Were you familiar with their previous work? Scott set all that up. I didn't know much about them before I got there, which is probably for the best or I really would have been too spooked to function. Was it your first time in a recording studio? I did three sessions in Vermont home studios so I sorta knew the basics. I had also done some sound work in my twenties so I knew a little about that. The Fidelitorium is just an extraordinarily luxurious and well-equipped situation. Fantastic board, a dozen tape machines, beautiful architecture and every instrument ever invented, practically. You had stellar musical accompaniment on the CD. What are some of your favorite contributions by others? Jim Brock playing the stairs is high on the list. Don and Chris [Frank] were getting ready to drive themselves insane trying to change the tempo of a percussion loop without changing the pitch and Jim wandered up and muttered, "I wanna play the stairs." He did and it was brilliant. It makes the song. Another involves Chris. When he showed up, we helped him unload and Don was asking what all he had brought. Chris is ticking off -- trombone, tuba, ukulele, tenor banjo... and Don really went rabid over the banjo. For some reason he said you can stick a light in it but don't think you're gonna play it. Then, when Don was mixing "Anything Goes," a song that might not have made the record if not for it being the book's title on account of it being too much of a classic Stonesy rock song. We hadn't found a way to make it fit the rest of the record. Chris walks in and starts doubling the signature guitar riff on the banjo. Everybody cracked up but Don and I were looking at each other thinking this is it, the missing link! Will there be a second CD? Well underway. Don suggested we concentrate on a series of Wyn poems, called Postcards, for a second album. Any interest in jamming with Dave Barry, Amy Tan and Stephen King? And John McEnroe, too. You know it!